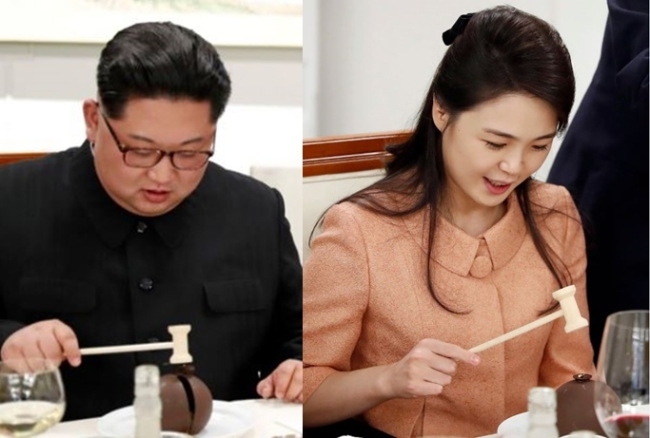 North Korean leader Kim Jong-un and his wife Ri Sol-ju appeared to be fascinated with the novel method of eating dessert served at the summit banquet, according to local media outlets. Mango mousse was the choice of dessert to be served to South Korean President Moon Jae-in, his wife Kim Jung-sook, Kim Jong-un and his wife Ri Sol-ju. Due to the hard exterior, the dessert could not be eaten with a fork or spoon. President Moon reportedly showed Kim Jong-un how to eat the seemingly complex dessert. 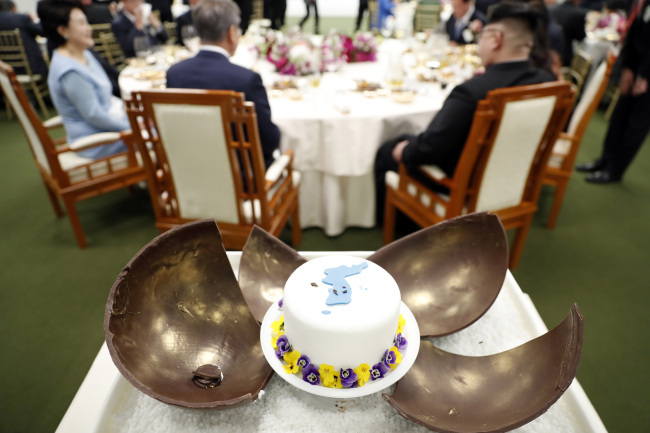 It is said Kim Jong-un cracked open the dessert with the mini hammer after carefully observing his South Korean counterpart. 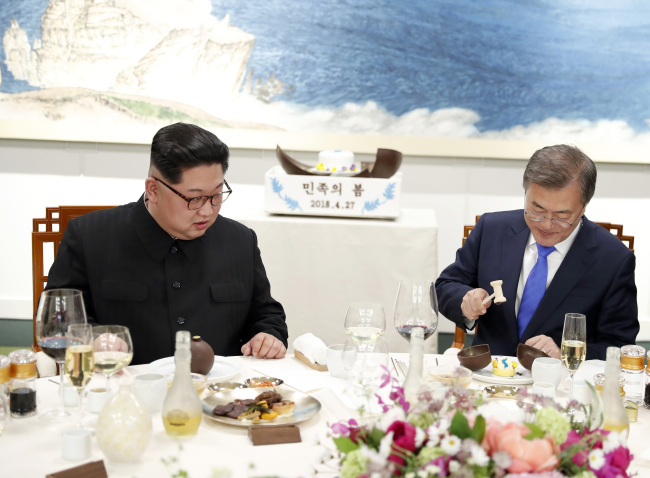 Once stripped of the layer, the two leaders and respective first ladies reportedly enjoyed the sweet mango mousse shaped like the unified Korean Peninsula, including Dokdo. The Japanese government had strongly opposed the idea that the summit dessert would include a unified Korea along with Dokdo. Many summit banquet photos taken on Friday showed Kim Jong-un and Ri with strong expressions on their faces as the soft mousse oozed out of its shell. 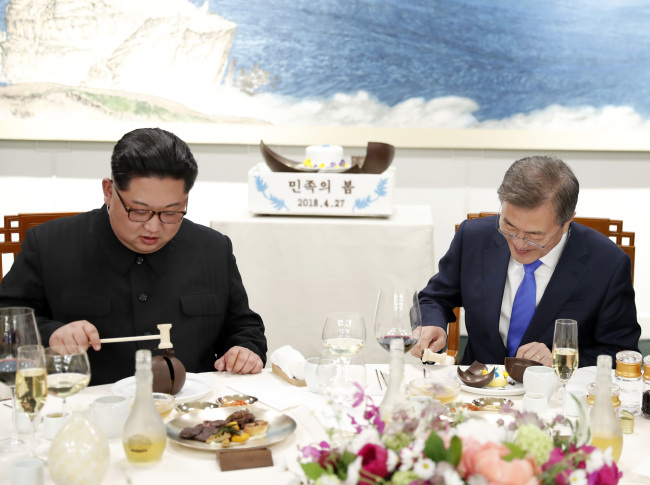 Local media outlets interpreted the dessert as being a symbol of “breaking the cold barrier” between the Koreas, marking a new era of peace and unity.